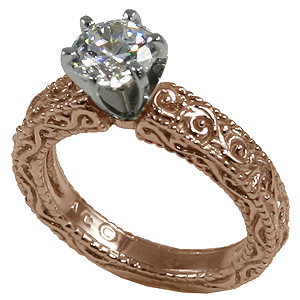 Stock #A119R:Antique / Victorian Style Engraved Solitaire/Engagement ring in Solid 14k Rose Gold ....... 1 or 2 CARAT ROUND RUSSIAN Cubic Zirconia.... Gorgeous hand-made piece!!! Beautiful, Hand-Crafted, top quality Jewelry workmanship!!!.... NICE, heavy, ring, shank. Matches #A118R Wedding Band! Beautiful Wedding set! Available by special order in other sizes and shapes may take an additional 2-5 days.